"A low calorie vegetable soup. Works well with broccoli, mushrooms, potatoes, or celery." Heat oil in a large saucepan over medium heat. Saute onion and garlic until tender. Stir in curry, and cook for 2 minutes, stirring constantly. Add broth and vegetables, and bring to a boil. Simmer 20 minutes, or until tender. Dissolve flour in milk, then stir into the soup. Simmer until thickened. Season with salt and pepper. Great tasting and easy to make. I found that I needed to add curry powder as well - for flavour rather than heat. It is great pureed too! 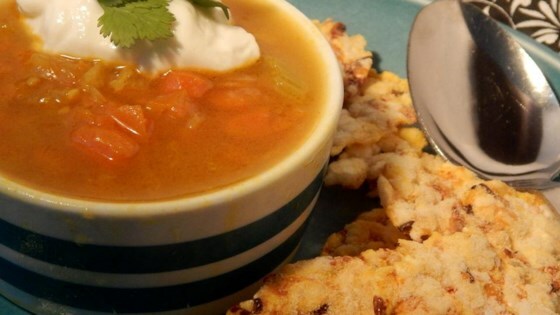 Very good - I used carrots, potatoes, zuccini and frozen corn - it was great! This soup was ok. My kids didn't care for it and we didn't like it enough to make again. It just didn't wow us. Thanks anyway. Be careful not to let the soup boil after adding the milk. I used biryani paste instead of curry paste - worked well.